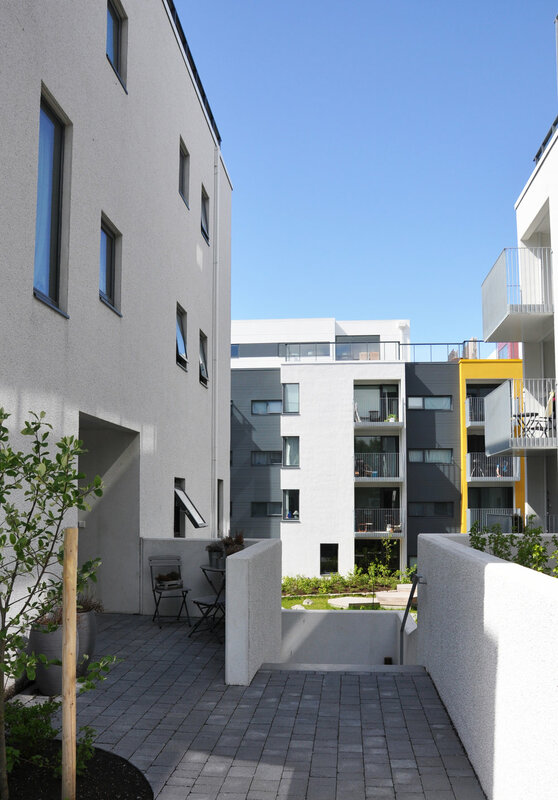 How does the project contribute to NBO – Housing Nordic’s vision of economically sustainable housing for all people? One of the key elements in the design of apartments in Smiðjuholt was variety and flexibility. By having these factors integrated in everything, the housing complex offers a wide variety of apartments which size varies from small studio apartments to large town houses on two floors. Families and households of different size and with different financial means should therefore be able to find suitable property. Smiðjuholt is a high quality building that requires minimum maintenance in the future. Building materials and methods were chosen with long term value in mind, sometimes meaning that initial cost might be higher but in the end it will save the owners money. Maintenance of the buildings will be taken care of by Búseti which will ensure that everything is properly maintained and shouldn’t need repairing or restoring due to negligence. The buildings have very affordable, central heating systems (the “rule” in Iceland, driven by geothermal power). A central air-ventilation system was necessary for the apartments to ensure good air quality. The outcast from this system is used to heat up the two-storey underground parking garage. Every apartment is very bright due to large windows which reduce the need for electrical lighting. All appliances and lights that Búseti provides fulfil the strictest requirements for energy consumption. How does the project contribute to NBO – Housing Nordic’s vision of ecologically sustainable housing for all people? Since the 1940’s the Smiðjuholt site had been a busy industrial area. In the early 2010’s Reykjavík city made a new local plan for the site in cooperation with Búseti. The local plan emphasized sustainability, communal spaces and landscaping, mixed type of housing, sustainable transportation, underground parking spaces etc. The project has added to the value of the neighbourhood by providing a new thriving housing complex with beautiful communal gardens. The new buildings reflect their neighbourhood in terms of form, scale and materiality. Each building is “broken up” into smaller forms to minimize the scale and relate to the surrounding houses that are of very different type and scale. Furthermore it enhances the possibility of daylight and vistas from apartments and between buildings, which was a very important factor in the design. Simultaneously it minimizes the negative impact on the surroundings such as shadow casting and obstruction of views. With sustainable transportation in mind facilities for bicycles are larger and better equipped than usually in Iceland. Each building has its own bicycle room in the basement and an area for fixing bicycles is centrally located in the parking garage (basement). Bicycle stands for inhabitants and guests are also provided in the garden. Every apartment has its own parking space in the garage and every space is equipped with an electrical charging device. During construction contractors were encouraged to recycle building materials as much as possible. For instance some of the concrete from previous buildings was used as landfilling and large rocks from the site were milled at the site and used for the same purpose. Recycling facilities within each house at the complex are considerably larger than minimum requirements in order to make it feasible for inhabitants to recycle. Throughout the project emphasis was made to use as environmentally friendly and reusable materials and building methods as possible. Many of the materials are certified as such. How does the project contribute to NBO – Housing Nordic’s vision of socially sustainable housing for all people? One of the key elements in the design of apartments in Smiðjuholt was variety and flexibility. This made it possible to design apartments that differ in size and layout. Within every apartment there is also a certain flexibility, such as making extra bedrooms adjacent to living rooms in the larger apartments and multiple possibilities for furniture layouts in all apartments. Every apartment is accessible to handicapped residents. In every building one apartment is owned by Reykjavík social housing and in one of the buildings an entire floor is used for an assisted living unit with six apartments. Great effort has been made to have all the apartments bright and preferably with view from the living room spaces, either long distance views or views of specific areas within the gardens. All apartments have either terraces or balconies which are important for the continuity of indoor/outdoor spaces and the possibility for residents to always be able to be in contact with the exterior. Entrances to the buildings are usually both from the streets and the gardens and most of the larger apartments have private entrances as well. Special care has been given to acoustics in the project, both due to strict regulations but also to provide comfortable settings for apartments in the middle of the city. 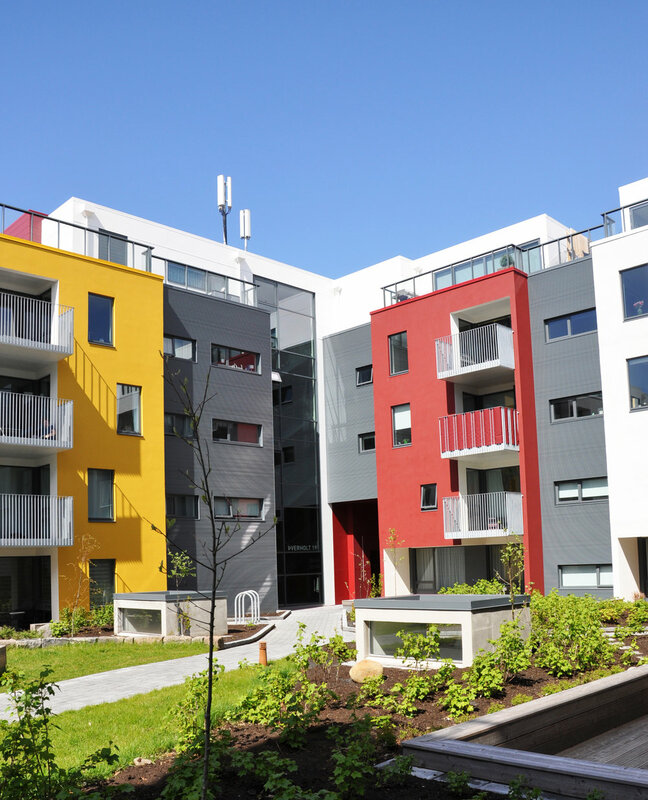 Apartment buildings in Iceland usually don’t have indoor communal spaces and most often the gardens around such buildings are very basic with lawn and parking spaces. In Smiðjuholt the communal spaces are very important, both for residents and the neighbours. Close to a public square at the southern edge of the site is a communal hall which residents can use for gatherings etc. Adjacent to the hall is a laundromat which opens up to the garden which encourages the use of the laundromat as a meeting place as well. Another laundromat is located in the northern part of the complex. There are two enclosed gardens within the complex, both of them sitting on top of the underground garages. The gardens are designed first and foremost for the residents but are open to public and are already being used by the neighbours as well. The gardens are peaceful places with all kind of trees, plants and flowers and small squares and paths winding through it. The residents can grow their own plants and vegetables in the garden. The industrial aspect of the site is an important factor in the history of Reykjavík. Therefore a special effort has been made to keep that story alive within the complex. Each of the 9 houses in the complex has a “historical relation” to the factory which used to stand there before, via historical photograph and information at the buildings’ entrances. This effort has been greatly appreciated by the inhabitants, their guests, neighbours and pedestrians on their way around the neighbourhood.